It used to be that customs agents, upon seeing a faux-Python series Hector Saxe luxury backgammon board, would delay you with bogus endangered species charges, and then steal a game on your board in the back room while you filled out paperwork. And who can blame them? The textured leather case and smooth inlaid leather playing field demonstrate the highest quality craftsmanship. Tan and ivory mother of pearl checkers feel splendid between thumb and finger as you plunk them down on defenseless blots. Even the brass fittings are a joy to snap open and shut. And while we do sympathize with Hector Saxe-smitten customs agents, we can't have them hassling our customers. And because our customers are known for their elegance but also their influence, it was an easy fix to ensure you are no longer waylaid by the covetous type. You may also rest assured that no pythons were harmed in the making of this outrageously handsome backgammon board. There have however been reports of severe maulings as Hector Saxe owners lure players like prey, constrict their options and dispatch them with disturbing regularity. 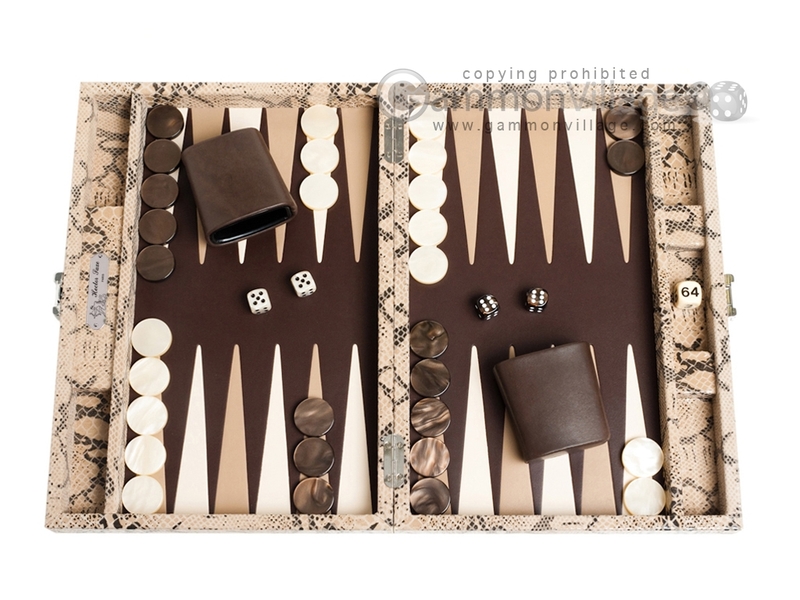 Click the specifications tab (above) for a detailed description of this quality backgammon board, including all materials and sizes. You may click any photo above for a closer view. Closed Length: 14 1/4" Width: 10" Height: 2 5/8"
Open Length: 14 1/4" Width: 19 7/8" Height: 1 1/4"
Cup Height: 3" Width: 1 3/4" Length: 3"
Page P4818 Copyright © 1999-2019 GammonVillage Inc., USA. All rights reserved.